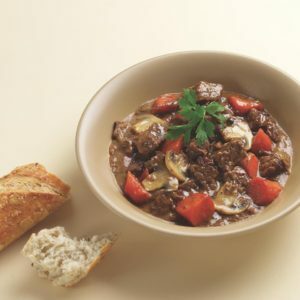 Welcome to the Richwood Meat Featured Recipes Page! so check us out there too! 1. Rub ribs with oil. 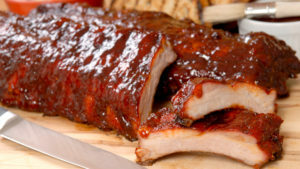 In a small bowl, combine the brown sugar, paprika, pepper, onion powder, garlic powder and cayenne; rub over ribs. Wrap in a large piece of heavy-duty foil (about 28 in. x 18 in.). Seal the edges of foil. In a small bowl, combine barbecue sauce and beer; set aside. 2. Prepare grill for indirect heat. Grill ribs, covered, over indirect medium heat for 1 hour. Carefully remove ribs from foil. Place over direct heat; baste with sauce mixture. Grill 20 minutes or until meat is tender, turning and basting occasionally with sauce. Melt the butter in a large sauce pot over medium heat. Add in the stew beef cubes, brown for about 10 minutes. Add 4 cups of warm tap water. Cover, let simmer on medium-low heat for 1 hour. Add Beef Granules, stir all ingredients well. Cover again, simmer for about 45 minutes or until potatoes are tender. Serve warm and Enjoy!